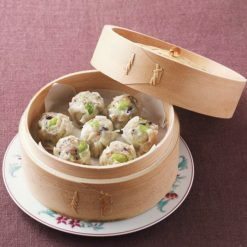 A Dim Sum classic, Shumai had a make-over with beautiful green edamame and 9 different grains. Enjoy the color, taste and the texture! 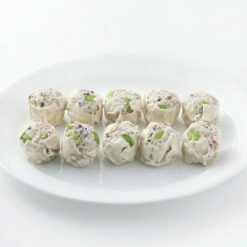 Product totals 180g (18g x 10 pieces). Edamame is green soybeans, and they are harvested from the tree while young and has gained its popularity in many of the Western countries in recent years for its nutrition not to mention the affordability and the snackability. Soybeans are commonly called “Beef of the Field” in Japan due to its abundance in protein. 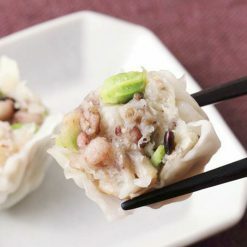 Edamame is also rich in various vitamins, calcium, iron, fiber, as well as beta-carotene and vitamin C, which are not contained much in matured soybeans. In Japan, edamame is often served as a snack when alcoholic beverages such as beer and sake are served. This is because Edamame’s protein contains methionine, which is a type of amino acid that helps break down alcohol, promotes the function of the liver and prevents hang-over. This product contains vegetables (onion, green soybeans, ginger), meat (pork, chicken), mixed grains (barley, pilled millet, foxtail millet, black soybeans, mung beans, red beans, black rice, black sesame, amaranth), potato starch, granular soybean proteins, sugar, salt , scallop extract, sesame oil, fish sauce, yeast extract, pepper, Shumai skin (wheat). Origin of ingredients: onions, pork (domestic), edamame. Prepared and packaged in Japan.